120 Roll Film, 5 Roll Pro-Pack. Please note: this product is now discontinued by Fujifilm. The only other colour negative film of a similar speed available in 120 is now Kodak Portra 160. 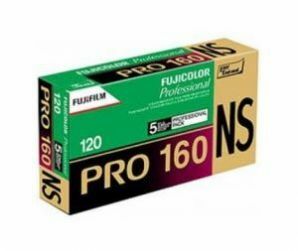 Fuji Fujicolor Pro 160NS Professional is an ISO160 daylight balanced color negative film. This film is aimed squarely at photographers looking for natural skin tones and features more highly optimized skin tone reproduction and neutral gray balance, especially important for portrait photography. It produces a lower contrast negative than it's sister film, Pro 160C. Through its use of Fourth Color Layer technology, the newest emulsion technologies and new coupler technology, this film is able to deliver better grain quality and smoother skin tone reproduction than current films. Moreover, thanks to its well-controlled gray balance, it provides a wider exposure latitude that makes it more suitable for digital scanners.